Arrive Kathmandu airport & after customs formalities walk out of the main exit gate where our representative will meet. Afternoon visit Swayambunath, said to be 2000 years old and one of the world’s oldest Buddhist chaityas. The stupa, which forms the main structure, is composed of a solid hemisphere of brick and earth supporting a cornice of copper and gilt. Painted on the four sides based of the spire are the all -seeing eyes of Lord Buddha. Situated on a hillock it is about 250 feet high above the level of the valley. Overnight at the hotel. After breakfast; drive to Bhadgaon (Bhaktapur), the home of medieval art and architecture. 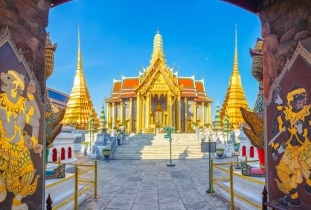 The city was probably founded by King Ananda Malla in 889 A.D. and is shaped like a conch shell. Bhaktapur, the city of devotees, lies nine miles east of Kathmandu and its traditional crafts are pottery and weaving. The SIDDHA POKHARI here is a historic reservoir near the city gate and it was built during the reign of King Yakshya Malla. Durbar Square here contains innumerable temples and other architectural show pieces: The Lion Gate adorned with the splendid stone figures of Hanuman, Bhairab & Narsingha Narayan; The Golden Gate built by Raja Ranjit Malla, which is the entrance to the main courtyard of the Palace of Fifty-Five Windows. The door is surmounted by a figure of Goddess Kali and Garuda, the winged carrier of Lord Vishnu, and attended by two sky nymphs; The Palace Of Fifty Five Windows was erected during the reign of King Yaksha Malla in 1427 A.D. and was remodeled by King Bhupatindra Malla in the 17th century, among the bricks of the walls, with their gracious setting and sculptural design is a balcony of 55 windows- a master piece of wood carving. Also visit Patan, indeed a city of beauty and grace. Planned on a circular format with Buddhist stupas (reliquary mounds) on the four points of the compass, the city is three miles south-east of Kathmandu city across the southern bank of the river Bagmati. Its most photogenic centre of attraction is the Durbar Square or the palace complex, which is situated right in the middle of the market place. It is a cluster of fine pagoda temples and stone statuaries. The stone temple of Lord Krishna holds a commanding position in the palace complex of Patan. Though its style is not wholly native, it has been reckoned as one of the perfect specimens of the Nepalese skill in temple craft. The three storied stone temples continue to elicit high praise from lovers of art and beauty.On the way back to Kathmandu stops at Boudnath Stupa. This colossal and ancient Stupa is one of the biggest in the world. Four pairs of eyes of Buddha in four cardinal directions are keeping an eternal watch over the people and their doings. Overnight at the hotel. Day 04: In KathmanduAfter breakfast, mountain View Flight From Kathmandu (subject to favorable weather conditions) Mountain flight operates daily sightseeing by flight to Mt. Everest and other Himalayan peaks. One hour* long sightseeing by fixed wing aircraft is a lifetime experience. All the spectacular glaciers, snowcapped peaks and gorges glide below as one flies toward Mt. Everest to circle around Amadablam Mountain bringing as close as 10 nautical miles to Mt. Everest. * Though it is known as one hour long flight but the actual flying time would be between 40 to 50 minutes depending upon weather condition. Groups can charter the aircrafts for a longer duration.At the end of the trip, airlines provide the passengers with a certificate signed by the flight captain that they had flown with Everest view flight. In case if the mountains are not visible due to the weather condition, passengers are given a choice of full refund or flying next day. In other word, this is sightseeing by flight with guaranteed satisfaction. Buddha Air operates with American made Beech 1900D aircraft (18 seater but sells only 16 pax in one flight) and ATR with 46 seats but sells only 23 pax. It offers guaranteed window seats to its passenger cruising at an altitude of 25000 ft for breathtaking view. Depending on the load factor, airlines operate several flights between 0630 hrs to 0930 hrs. Yeti Airways operates with Jet Stream (30 seater / sells only 19 seats with all windows).Today morning proceed with a tour of the Kathmandu City covering Hanuman Dhoka: this is the historic palace of the ancient kings of Nepal. A complex of many temples and monuments, guarded by a huge statue of the Monkey God, Hanuman, it has evolved to its present state of maturity over a period of centuries with contributions from a number of dynasties, headed by Malla Kings. Most outstanding example of Nepal’s art and architecture here is the towering nine-storeyed edifice known as Kailash. Also visit Residence of the Living Goddess near the Durbar Square, which is the residence of Kumari, the Living Goddess (virgin goddess). Its wooden balconies and windows are profusely carved. It was built in 1960 by King Jaya Prakash Malla. Also stop at Kasthamandap, the wooden temple built by Laxminarsingh Malla at the beginning of 17th century. It is situated at the main thoroughfare of the city and made of the timber sawed off a single tree. Finally stop at Pashupatinath Temple standing on the bank of sacred Bagmati river with two-tier golden roof and silver doors. It is famous all over the world for its superb architecture. Entrance into the temple precincts is restricted to Hindus only. The temple of Pashupatinath is a center of an annual pilgrimage on the day of Shivaratri. Though only Hindus are allowed to go inside the courtyard of the temple, therein tourists and visitors can clearly see the temple and the activities from the eastern bank of the Bagmati river. Overnight at the hotel. After breakfast at the hotel, drive to Chitwan. Upon arrival, check-in at your hotel. Afternoon enjoy your first Jungle safari (if time permits). The two prized animals of the Chitwan Park are the Royal Bengal Tiger and the great one horned Rhinoceros. Out of other wild animals see Leopard, Guar, Sloth Bear, Wild Board, Sambar Deer, Spotted Deer, Hog Deer etc. and over 400 identified species of birds in the park. Overnight at the hotel. Early morning have jungle safari. Then Elephants briefing, Canoe ride. Return to your lodge for a Lunch. Afternoon drives to Pokhara. Upon arrival, check in at the hotel. Rest day is at leisure. Overnight at the hotel. After breakfast, morning visit Sarangkot. Excursion to Sarangkot hill that offers great view of Mt. Fish Tail and other Annapurna range of mountains (subject to clear weather). A short hiking is also possible if guest wants the same.In the afternoon proceed for half day sightseeing of Pokhara city with Boating. 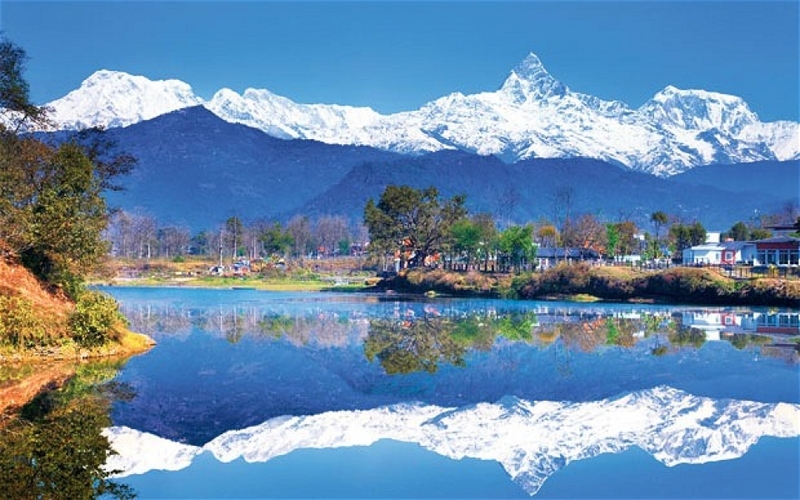 Sightseeing in Pokhara visiting Davi’s falls, Tibetan camp and local market with boating at Fewa Lake. OPTIONAL PARAGLIDING (TANDEM FLIGHT) (subject to favorable weather conditions) Paragliding in Nepal amongst the grandest scenery on earth is an inspiring experience. Float over mystery, shrouded monasteries, ancient places, beautiful turquoise lakes, ranging Himalayan rivers, exotic jungle and village forgotten by time. It involves a pilot flying with a passenger. Both of them have separate harness that is attached to each other and the wing. Paragliding harness are built for comfort and safety, they feel more like an arm chair. After take-off the passenger just sits back, relaxes and takes in the epic scenery. Even taking picture is not a problem. Paragliders can foot launch and gently foot land again and are very portable. We can take them anywhere and fly from most mountains in Nepal. Annapurna Panorama Flights: we take 20 minutes’ drive from Pokhara uphill to Sarangkot view point 2000 ft above Lakeside. This is where we take off. From here we can see three highest mountains in the world, Dhaulagiri, Annapurna and Manaslu all are over 8000 meters. There are three types of Tandem flights: Cloud Buster (Panorama Tandem flight): this midday flight gives you the thrill of high flights as we thermal up above Sarangkot in the company of eagles and vultures, 20-30 minutes. We land by the lake. Overnight at the hotel. After leisurely breakfast drives back to Kathmandu and check in at the hotel. Rest of the day is at leisure. Overnight at the hotel. Air ticket on Qatar Airlways on ”O” booking class : Beirut - Doha – Kathmandu - Doha- Beirut. Accommodation for 4 Nights in Kathmandu, 1 Night in Chitwan, 2 Nights in Pokhara with daily Buffet breakfast.